Because of our proprietary "Perfect Timing Car Buying Process" we're able to get the most desirable cars for a steal. We find the perfect vehicle, for the perfect price, at the perfect time. That means we're able to offer you the best cars at the most value anywhere. In order to keep our methods secret we can't allow other dealers to see our inventory. 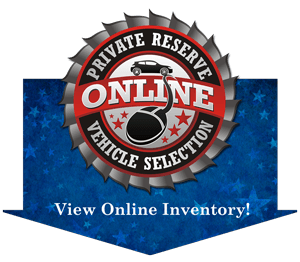 So if you want to check out our Private Reserve (some of our newest and best stuff) then simply fill out the form and prove you're not a dealer trying to spy on us.